Associazione Calcio Milan. AC Milan was one of the teams who had once conquered the whole footballing world. There was once a team honouring the crest and playing in San Siro. They showed the Milan faithful what it feels like to play it The Milan Way. Or as they call it in the land of Italia, Il modo di Milano. AC Milan, except the seasons of 80/81 and 82/83, have spent all their time in the top flight of the Italian footballing league. Milan have a staggering 18 titles at an international level, recognized both by UEFA and FIFA. The fourth most successful football team in an international level and the most successful football team in Italy. On a domestic front, Milan have an astounding 18 titles in the first league, 2 titles in the second league. They are 5 time winners of the Coppa Italia and 7 time winners of the Supercoppa Italiana. In conclusion, Milan are responsible for the formation of a team which has won everything the footballing fraternity has to offer these players, at any stage. Revisiting 2009, which arguably can be regarded as their best time. Milan’s squad consisted of legends and players who are today making a mark on the pitch and have achieved almost everything. The team included defenders like Zambrotta, Nesta, Maldini, Antonelli, Kaladze, and Thiago Silva. The midfield of this team had players like Seedorf, Kaka, Ronaldinho, Pirlo, Beckham. Imagine a midfield like that. And forwards included players like Huntelaar, Inzaghi, Borriello and Shevchenko. Aubameyang was in the roster but found it impossible to showcase his talent and his class in such a refined and competitive squad and was allowed to leave Milan. Between the sticks were Abbiati and Dida. And not to forget that Ibrahimovic joins the Milan side in the 09/10 winter transfer window. Fast forwarding to the current timeline. What happened to the team of such stature who are right now fighting for a spot to qualify for the European Competitions? Well, there can be an n number of reasons and theories for this. Firstly, being the sale of their top hotshot players like Zlatan, and Thiago Silva to name a few. These players, on any day represent a sheer class of game play in their respective areas of the game. When they were sold, in this case to a single team, Milan lost the backbone of the team. The prolific striker and their captain both went to PSG which left the team with ample amount of cash. Since their departure Milan found none who can fill in their boots. Well to be honest, it can be very difficult for any team to find players to replace such maestros. Especially players like that. Furthermore, the team was too dependent on players who had surpassed their legacy. AC Milan is known to retain the players who have served them. All legendary teams have been known to rotate their squad to bring in fresh blood. It helps them stay contenders in their league and in competition with European top clubs. Although, Milan decided to stick with the old faithful. AC Milan kept their legendary status players like Bonera and Abbiati. They played till ages of 35 and above. It is although to be seen that players in the Italian League play for a very long time. It is probably that the clubs, for which they play for, believe in the fact that “Class is Permanent”. This statement does stand alibi in case of certain players like Gigi Buffon and Totti. In addition to that, the club was very late to accept that football in today’s scenario is about huge investments. Even if goes down to selling huge amount of shares of the club and changing the club hierarchy. Certain clubs saw favors changed when huge amounts of cash was injected to the clubs. AC Milan have accepted this fact that the football is evolving. It needs an injection of cash to revive the team. They have done so by selling it to the “Rossoneri Sport Investment Lux”. The current owners of the team bought the team by buying 99.93% of the shares of the clubs, with the remaining 0.07% being retained by the previous owners. After the takeover, the new club owners wanted to bring in new players and revolutionize their new team. They wanted to make a statement. However, it underlined the statement that new players were the need of the hour. It was necessary to develop a new team which challenged other teams in the league and in European Competitions. Lets’ take a look on the signings done by Milan after their takeover. We shall also see which other areas they might need to improve to bring back the glory for the Rossioneri. AC Milan started to build from scratch. They realized that the defense needed to be fortified so that goals don’t come by easily for opponents. It is said that a good defence can help you win titles. Following this philosophy, Milan have signed a right back, a left back, and a centre back. The right back signed by Milan is Andrea Conti. Conti joins the Rossioneri side after an impressive 16/17 season. He played 33 games out of the 38 in the Serie A side scoring 8 goals, providimg 4 assists, and racking up 12 yellow cards. He played a total of 2669 minutes in the league. In the Coppa Italia he played 2 matches. He is credited with an assist, and played 98 minutes in the competition in total. He recently got his first senior cap appearance for the Italian National Team, against San Marino. Aged 23, he arrives at San Siro for 21.25 million pounds, securing the right flank for the team. The second signing for Milan is left back Ricardo Rodriguez. The Swiss national is a versatile left back operating in the left mid and in centre back position. He joins Milan after a superb season where he played 24 matches where he scored 2, assisted 3 goals, and maintained excellent disciplinary record having got only 1 yellow card. After playing 2019 minutes in the German league last season, he joins the Rossioneri for 15.3 million pounds. In addition to the full backs is a centre back. Milan brings in Mateo Musacchio. With 6 international caps, the Argentine is finding it difficult to establish himself as one of the main defenders of the national side. Analyzing his 16/17 season, he played 30 matches in total where he played 2646 minutes and assisted twice. His preferred position is Centre Back. He switched to Milan, because he gets a chance to prove his worth in AC Milan. Since the World Cup is round the corner, the player can show his worth for the Argentine Squad. Moving on to the midfield, where in lies the heart of the team. The midfield is responsible for creating goals, as well helping out the defence when the team needs it. Milan decides to sign versatile players, who also complete the overall structure of the midfield. This carves out way for signing of midfielders who excel in their respective fields. Milan secure the signature of Franck Kessie. The Ivory Coast player plays in the defensive midfield but can also operate in the positions of a centre midfield, or a centre back. Taking a look into his last seasons’ performance, the man is responsible for 6 goals and 4 assists. Although he racked up 5 yellow cards, he played for over 2200 minutes in the league helping Atlanta qualify for Europe. The 20 year old, joins Milan for 6.8 million pounds, and will be complete the transfer in the next season for 17 million pounds. He has already been capped by his national side 16 times, even at such a young age. The second midfielder to join, the black and reds, is the Turkish wizard Hakan Calhanoglu. The attacking midfielder, takes the number 10 in the squad. He is the best set piece player in Europe, thereby beating the likes of Messi himself, statistically speaking. The FIFA regulatory authority’s ban on the player didn’t let him play for most part of the season. Nevertheless, last season he played 15 matches in the league, and 22 matches in total. He scored 7 goals, assisted 7 times and racked up 2 yellow cards. Turkey called him up 26 times, him scoring on 8 occasions. Joining Milan from Bayern Leverkusen, for 18.7 million pounds, he completes the renovation process of the Milan midfield. Last but not the least, are the forwards. The forwards, in their prime can change the game at any point. This is why the forwards are their worth in gold. Milan always had noteworthy era defining forwards in their squads, be it Inzaghi, Shevchenko or Zlatan Ibrahimovic. Milan sign one of the most promising players in current footballing scenarios, Andre Silva. The Portuguese commands the area of centre forward, but can also operate on right wing, or can be paired up with another striker upfront. The 21 year old has played 13 matches for his national side and has scored 8 times. He was recently showing his class in the Confederations Cup, held in Russia. His 16/17 season was very impressive. He played 32 times in the league where he scored 16 times and assisted on 6 occasions. In total he played 44 times in the whole season, amassing 21 goals, assisting 8 times, and receiving 9 yellow cards. Other signings in the forward position include Fabio Borini. The player brought in on loan is an ex-Liverpool player. He along with Franck Kessie will complete a permanent move next season worth 5.1 million pounds. Milan has also gone on sign a keeper. Antonio Donnarumma, brother of Milan’s first choice shot stopper Gigi Donnarumma, has been brought on as a backup keeper. Rumors suggest Gigi Donnarumma, signed a contract extension upon meeting of his condition to bring his brother in the team. Some of Milan’s Signings this season. ( Clockwise from Top Left )Andre Silva , Mateo Musacchio , Ricardo Rodriguez and Franck Kessie via Marca. Milan’s current transfer window activity, demonstrate that a team is being made, worthy to compete across all competitions. However, “Rome was not built in a day”. Rumors persist about Milan desperately attempting to sign Aubameyang. It will be fantastic if Milan are able to bring in another attacker as well as a midfielder. However, if Aubameyang does sign for Milan he will do a “Paul Pogba”. 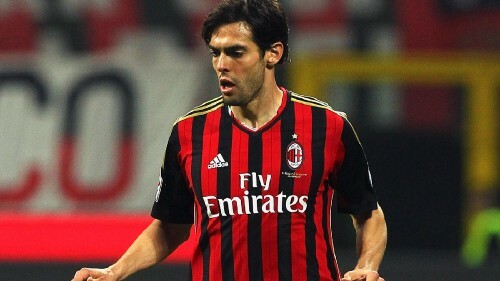 His signing will show Milan’s competitors that a massive overhaul is under process. The amount spent on the signings by the new management makes a statement that money won’t be a hindrance. The Milan faithful will be expecting Milan to challenge the throne of Italy and the throne of Europe. The post Rejuvenating the Renaissance appeared first on El Arte Del Futbol.